Superintendent Tony Deem presents the Distinguished Veteran award to Dale Hart. Veteran Gary Willford salutes as third grader Leland Parker and student mentor Trey McNickle lead the student body in the Pledge of Allegiance. The Southern First graders sang patriotic songs at the Veterans Day assembly. Southern guest speaker Veteran Lt. Colonel Zane Beegle is pictured with Superintendent Tony Deem at Friday’s ceremony. 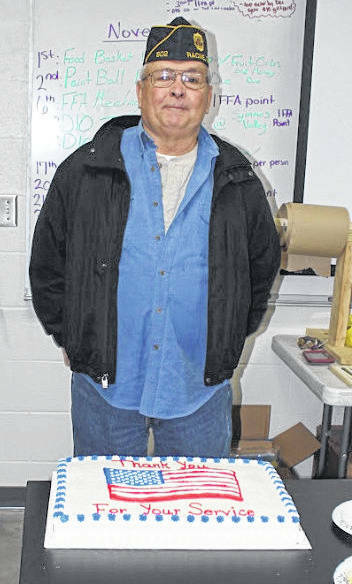 Honoree Dale Hart is pictured with the Veterans Day cake. 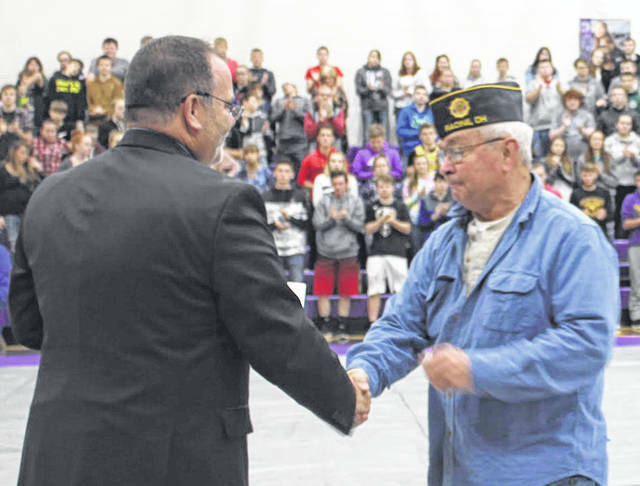 RACINE — During the 13th annual Veterans Day assembly at Southern High School, longtime community steward Dale Hart was honored for his distinguished service in the United States Navy. The ceremony began with the color guard from the Racine American Legion Post 602 posting the colors for the large crowd in attendance. Portions of the crowd consisted of Veterans and their families, community members, Southern staff, and the student body, grades 4-12. Following the presentation of the colors, a video — “A Veteran’s Voice” from Floodgate Productions was played. High School Principal Daniel Otto gave the opening welcome. Veterans in attendance were recognized and given the opportunity to state their name, rank, branch of service, and years served. Upon conclusion of the introductions, Otto called upon the crowd to applaud for the Veterans. Almost simultaneously, the applause turned into a standing ovation for the local heroes. The Southern High School Band directed by Audra Wilkinson played the National Anthem, and Student Council President Marissa Brooker led the crowd in the Pledge of Allegiance. School counselor Russ Fields, himself a Veteran, played another video — “No Greater Love”. “This community and the people in it are what our Veterans here today fought for,” Beegle noted. The Lt. Colonel spoke of how Veteran’s Day began with a commemoration to honor the end of World War I on the “11th hour, of the 11th day, or the 11th month”. Southern Superintendent Tony Deem then made the presentation to this year’s special honoree Dale Hart. Hart is known for his unselfish legacy of community service. Usually known throughout the community as the one giving, the tables transformed Hart into the receiver of the 2018 Southern Local Distinguished Veteran. Veterans quotes were read by members of the National Honor Society: Peyton Anderson, Austin Arnold, Marissa Brooker, David Dunfee, Mallory Johnson, and Madison Lisle. Supt. Tony Deem and Marine Veteran and Southern IT employee Ed Baker read the roll call for honoring those Meigs Countians who made the ultimate sacrifice. As the names were read, the bell tolled and a candle extinguished in the heroes’ honor. Student Council members Parker Corbitt and Tori Chaney tolled the bell and extinguished the candles, respectively. The sacred moment was followed by a rendition of Taps by Kalandra Nero and Claire Bradbury. The legion then retired the colors. Scott Wolfe was the Master of Ceremonies. Earlier in the day, a similar ceremony was held in Pre-K through third grade led by Principal Tricia McNickle. Beegle was also the guest speaker at that event. The first grade students sand patriotic songs and the band also played Anchors Aweigh and The Caissons Go Rolling Along. Third Grade student Leland Parker, led the student body in The Pledge of Allegiance. Refreshments were served to the Veterans and their guests by the National Honor Society. Over the past 13 years Southern has honored 13 Distinguished Veterans. The list includes Ralph Triplett, Eugene Jeffers, Tony Deem, George Lawrence, Spencer Carpenter, Delbert Smith, Kenny Theiss, Charles W. Bush, Paul Beegle,Tom Diddle, Tom Wolfe, Bill Cross and this year’s honoree Dale Hart. 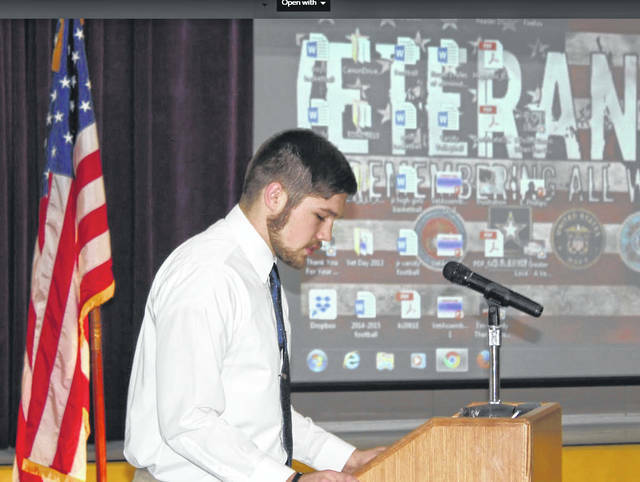 https://www.mydailysentinel.com/wp-content/uploads/sites/14/2018/11/web1_11.13-Southern-1_ne20181110104853324.jpgSuperintendent Tony Deem presents the Distinguished Veteran award to Dale Hart. 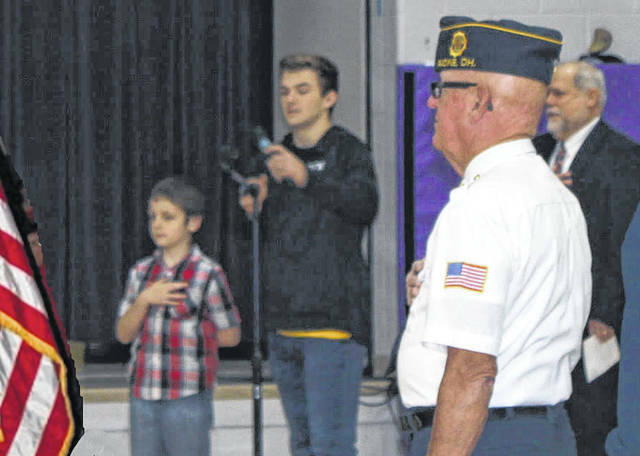 https://www.mydailysentinel.com/wp-content/uploads/sites/14/2018/11/web1_11.13-Southern-2_ne20181110104855219.jpgVeteran Gary Willford salutes as third grader Leland Parker and student mentor Trey McNickle lead the student body in the Pledge of Allegiance. 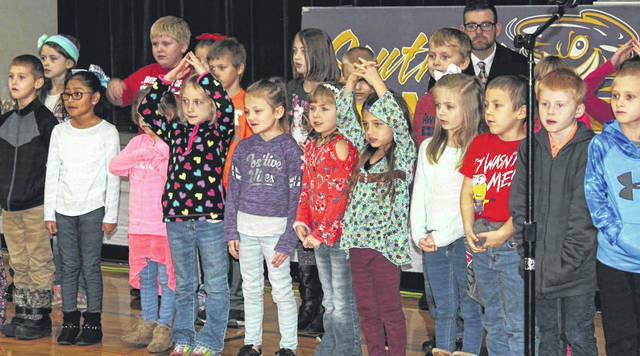 https://www.mydailysentinel.com/wp-content/uploads/sites/14/2018/11/web1_11.13-Southern-3_ne20181110104856628.jpgThe Southern First graders sang patriotic songs at the Veterans Day assembly. https://www.mydailysentinel.com/wp-content/uploads/sites/14/2018/11/web1_11.13-Southern-5_ne20181110104859444.jpgSouthern guest speaker Veteran Lt. 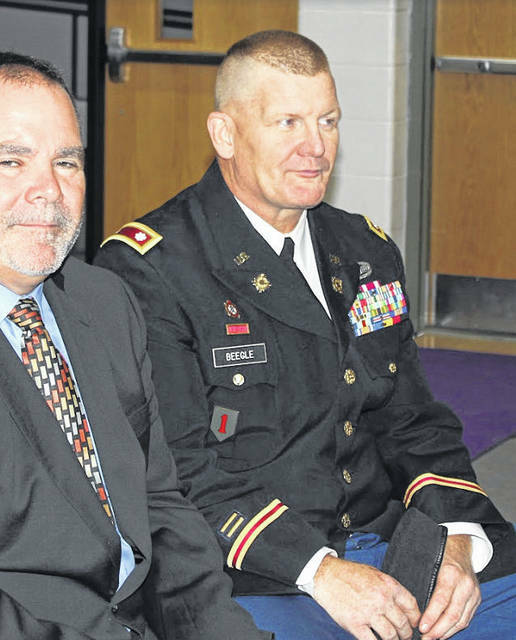 Colonel Zane Beegle is pictured with Superintendent Tony Deem at Friday’s ceremony. https://www.mydailysentinel.com/wp-content/uploads/sites/14/2018/11/web1_11.13-Southern-6_ne2018111010490617.jpgHonoree Dale Hart is pictured with the Veterans Day cake.